Running counts as a vigorous-intensity aerobic exercise. This means it takes a smaller investment of time to improve your health and burn significantly more calories than low or moderate-intensity exercise. At a speed of 5 mph, you would need to run 48 minutes a week to cover four miles. The Centers for Disease Control recommends a minimum of 75 minutes of vigorous exercise a week to maximize health and weight management benefits for individuals who choose higher intensity activities such as running. Whether you run one mile four times a week, two miles two times a week or knock out the entire distance in one workout, your total calorie expenditure will range from 334 to 400 calories, based on a body weight between 155 and 185 pounds. The higher your body weight, the more calories you burn. If you run faster than a 12-minute mile, your potential calorie expenditure increases. Your hard work only translates to weight loss, however, if you establish a calorie deficit. If you're maintaining your weight on your current eating plan, adding running to the mix should support gradual, healthy weight loss. A deficit of 3,500 calories translates to a 1 pound reduction in body weight. Based on an average calorie expenditure from your running program of 550 calories per week, it would take slightly more than six weeks to lose one pound. Changing your caloric intake, however, will boost your weight-loss potential. Gradual weight gain indicates that your calorie intake exceeds your energy needs. If you're slowly putting on weight, you need to combine your running program with changes in your eating habits in order to lose weight. Consider adjusting your diet even if your weight is stabilized if you want to lose weight at a faster rate than exercise alone supports. Reducing your caloric intake to 250 calories less than your weight-maintenance level translates to an additional pound lost every two weeks. Exercise alone as a weight management strategy has the potential to produce modest weight loss if your diet is already at a healthy level. While four miles per week is a good start, adding mileage as your fitness improves increases your potential for weight loss. Adding other forms of exercise, such as walking, bicycling or swimming, to your fitness regimen is another option for maximizing the weight management benefits of exercise. 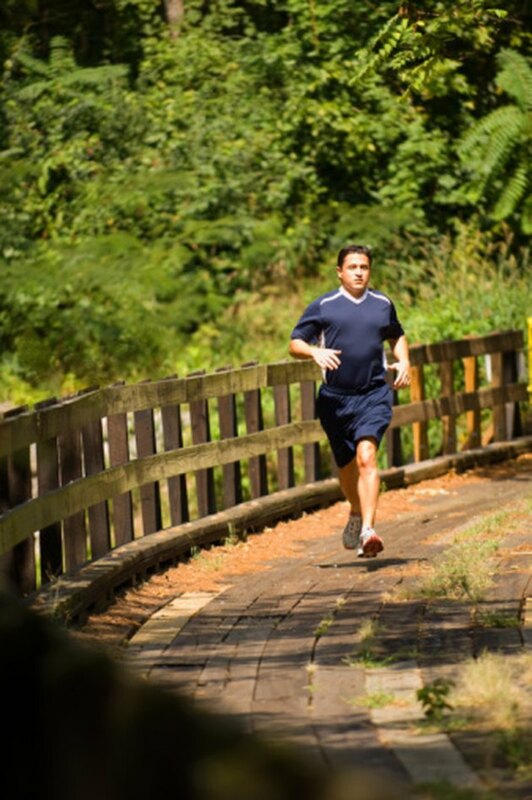 Check with your doctor before starting a running program if you have a history of heart or orthopedic problems.